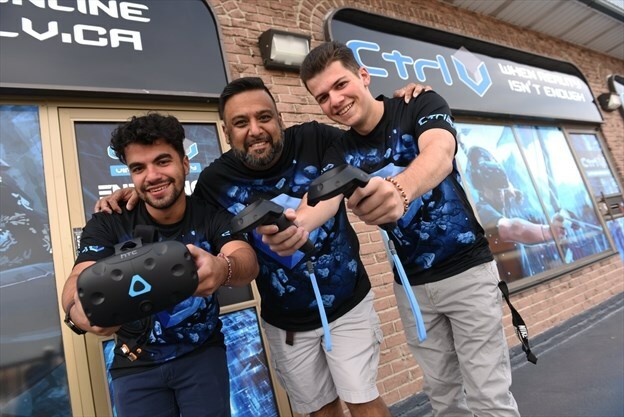 Ctrl V in Brampton had its grand opening Sept. 8, with 25 virtual reality games, ranging from the kid-friendly to the adult. Games like Cowbots and Aliens, Beatsaber, and Electronauts are ideal first-timers. There’s an 18+ age filter for blood, guts, and gore. Meanwhile games like The Brookhaven Experiment and Affected: The Manor are more suited for older kids and adults who want a real scare. Ctrl V even has multiplayer games that you can play with a group of friends, like Kiss or Kill VR, or the Virtual Dodgeball Smashbox Arena. Ctrl V allows you to rent booths by the hour, and you get a full 60-minutes of play. You can come solo or bring friends and family, and there’s even a party room. You step into a virtual reality booth, don a headset, take the controllers, and choose a game. After countless hours and multiple birthdays and holidays spent at The Hospital for Sick Children (SickKids), Gregory now refers to the hospital as his “second home”. His journey began when he was three weeks of age when he came to SickKids for a CT scan as his pediatrician was concerned about protrusion of his eyes and the shape of his skull. Several weeks after his initial appointment, and unrelated to his craniofacial symptoms, he again returned to SickKids for emergency surgery for pyloric stenosis, a gastrointestinal condition where the opening from the stomach to the intestine is blocked. This was the first of many complex surgeries that Gregory would face. It wasn’t until he was nearly two years of age that Gregory was definitively diagnosed with Crouzon Syndrome, a genetic disorder that causes certain skull bones to fuse and thus affects the shape of the head and face. At nine years old Gregory’s healthcare team also discovered that he had Osteochondritis Dissecans, which is a bone and cartilage defect in both his knees. He also has additional muscle tone issues that make it difficult for Gregory to perform everyday activities, like standing or writing for extended periods of time. As a result of his diagnoses, Gregory has undergone 25 surgeries. Among them, 14 were brain surgeries, four major craniofacial surgeries and multiple other expansion surgeries as his Crouzon Syndrome prevents his skull from growing and puts pressure on his brain. Gregory also suffers from permanent eye damage so he received specially made glasses from SickKids to synchronize the vision in his eyes. However, Gregory remains legally blind due to a lack of depth perception and peripheral vision. He also has a hearing loss, requiring him to wear hearing aids and use an FM system at school. In addition to the support of the medical staff, Gregory has memorable experiences with the therapeutic clowns as well as the Child Life Specialists who have toys, play games and do arts and crafts. Gregory says that if you meet anyone wearing a multi-coloured SickKids lanyard, you’re guaranteed to be meeting someone ‘super-nice!’ They are able to keep his mind off of anything that might be worrying him. Dorothy can’t remember her first experience at The Hospital for Sick Children (SickKids), but the scar on her chest caused her to ask questions and find out. Her mother, Anna, wrote a diary about her daughter while they were in hospital and shared the memories with Dorothy. Now, Dorothy wants to help children in need and says she will always fundraise for SickKids as she grows up. From Dorothy’s first Pediactrician visit at two days old, she was monitored by her pediatric cardiologist and doctors at Sickkids. She was under observation for a congenital heart defect and they anticipated she would need surgery when she was bigger and stronger. At 7 months old, her cardiologist decided it was time for Dorothy to go to SickKids for more specialized care. They knew from the time Dorothy was born that she would eventually need open-heart surgery to survive. SickKids performs more than 85 per cent of paediatric cardiovascular surgery in Ontario. Dorothy was treated through The Labatt Family Heart Centre at SickKids – one of the largest paediatric heart centres in the world where more than 300 doctors, nurses and other highly trained health-care professionals provide the best-in-class care. Dorothy underwent surgery to treat her underdeveloped heart. With Tetralogy of Fallot, a hole in the lower chambers of the heart allows oxygenated blood to mix with deoxygenated blood so the body receives less oxygen than normal. Dorothy’s open-heart surgery was successful and she was able to return home 2 ½ weeks later. She had a minor complication causing her to rely on a G-tube for two months, but has otherwise been healthy. In fact, she no longer requires follow up with SickKids at all. Her appointments are now entirely with her cardiologist closer to home. Dorothy still feels a connection to SickKids and, in 2015, attended Camp Oki for the first time – affiliated with SickKids, Camp Oki is Canada’s first Summer Camp for children with congenital heart disease. She made new friends and is eager to stay involved in the SickKids community through fundraising. Chatting with Geoffrey is similar to chatting with a physician or someone who has a PHD in biology. Medical language flows off his tongue with incredible ease. And then one stops and realizes that Geoffrey is a 14-year-old boy. His scientific knowledge comes from his direct experience as a SickKids patient. In 2014 Geoffrey began running a very high fever (40°C). The fever wouldn’t break. He had low appetite and generally was feeling unwell. His doctor ordered blood tests and learned that his liver enzymes were abnormally high and told Geoffrey’s family to take him to The Hospital for Sick Children. He was seen by the Emergency Department and there were findings of viral infection. He was sent home and told to return if his symptoms didn’t resolve. A couple of weeks later his temperature was still elevated and he was admitted to the general paediatrics unit at SickKids and during the month-long period during which his fever didn’t subside he had many tests and workups. With no definitive diagnosis his medical team sent him for a bone marrow biopsy and aspirate. It was then that a diagnosis was made. Geoffrey had HLH (Hemophagocytic lymphohistiocytosis), an aggressive and life-threatening condition of the immune system. In HLH, the immune system gets confused. Sometimes, it works too much, causing excessive inflammation and tissue damage. Other times, the immune system fails to work normally, leaving patients at risk for serious infections. Geoffrey began treatment as soon as the diagnosis was made. While he experienced side effects, initially he had a good response to the medicine and had regular clinic visits in rheumatology and haematology. During a follow up, his blood work showed very low counts and further testing lead to a new diagnosis of MDS, Myelodysplastic Syndrome. From this point on Geoffrey began to be seen by the Bone Marrow Failure Clinic. He was placed on a new trial drug with a goal of preparing him for an unrelated bone marrow transplant. A suitable donor was found and in January 2016 Geoffrey went into the SickKids Bone Marrow Transplant Isolation unit. He spent about a month in the unit. Geoffrey then began to experience many post-BMT complications, the most serious and chronic of these being graft VS host disease. Since his bone marrow transplant he has suffered serious liver damage and his medical team has been trying to strike the proper balance of medications to battle the graft VS host disease while ensuring that his liver is not suffering further toxicity from the drugs. Geoffrey has been hospitalized numerous times since 2014, usually for viral infections. With each admission he is placed in isolation of the bone marrow transplant unit. Are You Sold on the Brand? We need people that believe in our mission and our vision. We are working to fight the same battle together and have virtual reality adopted by as many people as possible. Do you think we are doing it right? Do you agree with us? To be part of the team we have to be on the same side. We have to have the same corporate voice and culture and the same drive. Obviously, we all want to make money but at Ctrl V we firmly believe that if we focus on building a great company instead of a good one, everything will fall into place. This is part of our brand. Are you on board? Do you have Grit and Moxie? Ctrl V locations pride themselves on their success through community involvement. We’ve been told a number of times that what sets us apart is that the community supports us and connects with us. This doesn’t happen without us getting involved in the community first. We go to local events, partner with charities, and donate our services and names to organizations we believe in. Public Relations starts with you and your community. Don’t be fooled by the common misconception that once you open a business like Ctrl V, people will come. This doesn’t happen anywhere. You’ve got to be in the mind frame that this is dependent on you. You need to get out into our community and build a network. Depending on the franchisor and our ad fund to grow your business will surely spell disaster. Be aware that if this isn’t something for you then we probably aren’t a good fit for each other. Franchising has the benefit of being part of a team and being able to draw from a large pool of resources and experience. As a Ctrl V franchisee you immediately become part of the largest network of unified VR arcade operators in the world and if you aren’t team-oriented you won’t be able to take advantage of the team resources at your fingertips. Don’t overlook the fact that you will be hiring staff and with the new Joint-Employer laws around the world, a lot of the human resource work is going to depend on you. You’re taking on entry-level employees that tend to have a lot of turnovers or are usually students. It is going to take some leadership skills to help keep them motivated and believing in our brand and mission just as much as you do. You have to remember that things don’t change overnight. If you have an idea that you’d like to implement through the system you have to realize that it may take time to get things vetted, approved, and deployed, especially if this is a bad idea. Not everyone is right all the time and if there is something that has people wondering, then vetting is extra important. What about growth? Multi-unit expansion? Marketing conversion? These are all places where new business owners forget that time is of the essence. Entrepreneurs all exhibit an element of creativity. This is important as a member of the Ctrl V team. You are responsible for driving traffic to your location and this doesn’t come easily. You’ve got to be able to generate ideas on how to market and engage your community. You’ll want to apply focus on efficiency and working smart in addition to working hard. We’ve spent a lot of time refining how we do things. Things that set us apart from our competition. As a result, we are looking for partners that are good at following processes and can understand and respect our systems. We are always open to suggestions and ways to improve things but at the end of the day, if you aren’t a person who can follow direction and are more apt to build your own concept, then maybe franchising with Ctrl V isn’t for you. Although you’re buying into a proven system, we are still building a brand together and fighting the battle of getting virtual reality adopted by the masses. It is possible that you may not experience cashflow right away despite the research that you do and the model that we’ve created. You’re buying into a brand and signing a contract with us, so it is important that you have the financial capacity to grow along with us. We’re always looking for people that fit our team and goals, but having financial stability is important too.